Pluckley Screaming woods is one of our most popular ghost hunts which is attested by the amount of time in advance people have to book, which at the time of writing is 4 months ahead of the event. Everyone came dressed for the weather, which as usual was rain, although the rain didn’t arrive in the woods until we were at least half way through the night. After walking to the centre of the woods I handed out our usual ghost hunting equipment, which consisted of KII meters (with are proximity metres [to spirit]) and our Ghost Pro’s which are communicators through a series of flashing. It took a while, but eventually spirit started to come forward, first a male spirit who had leather patches on his trousers, which I thought may have been a woodman, as it turned out he wasn’t. He was a pig farmer who kept pigs within the woods. Although he never actually gave me his name he was aged in his late 30s and came from the mid-1800s. He was quite happy to answer questions that John (guest) asked via our communication equipment. We were also joined by a female spirit who was aged in her late 20s, possibly early 30s and she also didn’t give me her name. She seemed shy and reluctant to answer questions. The KII meters never lit up at all, much to our disappointment. The two spirits seem to be opposite each other and communicated with the people who were closest to them, so the pig farmer communicated with John and the female spirit communicated with Cheryl & Kerry (guests). David & Charlotte (guests) didn’t have a communication device but both kept seeing odd shadows and lights within the woods. Kerry and I also kept hearing mumbling and talking, which was like a conversation being carried on the wind, but at that time it wasn’t windy in fact quite still and I couldn’t work out or hear what the conversation was about although it seemed relentless. Several people started to take photos and Kerry & Cheryl had strange anomalous photos with unusual light anomalies which I have never seen before here or in fact anywhere else. John kept seeing a shadow walk between two trees and every time he saw something come towards us his communication device lit up. He asked (not out loud) whether the spirit kept pigs and then felt something brush past him, I too felt something on my foot and looked down but saw nothing. I decided that the best way for the guests to feel the spirit energies and experience their energy first hand was to hold a séance. Neither of the spirits that we were communicating with earlier seemed to want to do anything but just as I was wondering whether anything at all would happen a very well dressed spirit called Alfred turned up, he looked like he could have been a mayor or a councillor because he was wearing a very smart suit, he was about 5’8” in height and aged in his late 50s and had a “handlebar” moustache. Alfred was able to move our arms and started with Charlotte and me, which progressed around the left hand side of the circle, leaving just Kerry. As I reassured her to relax and loosen her grip with me our hands started to slowly rise. I then asked Kerry to ask Alfred to move her hands in a particular direction, which Alfred slowly accomplished. Several times my arms were pulled downwards and both guests on either side of me could feel the weight and pressure, although I insisted that I did not want to touch the ground since it was very wet and muddy. Alfred moved my arms to within a whisker of the ground just to prove a point! At various times whilst we were being moved, I and some of the guests heard footfalls and whispers plus the strange relentless talking, which wasn’t getting louder or quieter, if it were carried on any wind then I would have expected that. When I asked Alfred to gently push people he moved around the circle and one by one everyone fell backwards, very gently, but enough to know that they were not just losing their balance and David was picked more than anyone else. Cheryl however was not moved at all but Alfred did try a few times but it didn’t work. From here we moved on to another part of the woods where I switched on my spirit box (a device that scans the FM radio band in reverse at 100ms) and asked for any spirit to say our names. It took a long time but eventually a spirit came and said three of our names and when asking for how many people were present we all heard 10, but there wasn’t ten of us, just six. However we don’t know how many spirits were present as they didn’t answer that question. By this time the rain had started to fall, not terribly heavy but enough to know it was raining. We happened to be standing beside some trees that when the wind blew creaked and groaned like an old wooden door which added to the atmosphere! But every time that I asked for a noise this particular tree squeaked which became rather annoying. Using the laser grid here as well didn’t produce anything interesting because the rain was interfering with the beam although communication continued and a few times the KII meter that David was holding lit up a lot, which surprised him, although the other KII held by Cheryl and Kerry didn’t. Kerry and I could still hear this odd talking noise, although we both thought it was coming from different directions, I thought it was coming from deeper in the woods whereas Kerry thought it was coming from the edge of the woods, unfortunately none of the other people could hear this talking sound. As we started to make our way out of the woods, past an area that people used to live in the woods as late as the early 1900s I could distinctly smell a wood fire, which given the amount of rain we have had recently was hard to believe especially on this particular night because of the level of the rainfall. No-one else could small a fire although John smelt what he described as an odd smell, but couldn’t describe what it smelt like. Given the weather no EVPs (Electronic Voice Phenomena) experiments were undertaken because the only noise that would have been heard was the rain, which was a shame because we have had some excellent EVPs from our Pluckley events. Given the weather this was an excellent ghost hunt with lots of noises and physical paranormal activity felt by the guests and one in which all those present thoroughly enjoyed the experience. Normally we don’t write reports from our private events, however this particular night was too good not to write a report as the level of paranormal activity felt by all the guests was on par with what we would have expected at a public ghost hunt. We split the whole group into two smaller groups and each headed off in different directions. The area that I had chosen for the night is an area which I often take people because it is one of the most active areas within the whole woods and usually people experience something. I started off by handing out some of our electronic ghost hunting equipment and within a few minutes everything started to light up, which meant the spirit energies were with us, some briefly whilst other stayed longer so that questions could be asked and answered. Harry (guest) felt his hair and neck being touched which slightly unnerved him and when this occurred he wasn’t quiet about it, which made everyone else in the group jumpy. 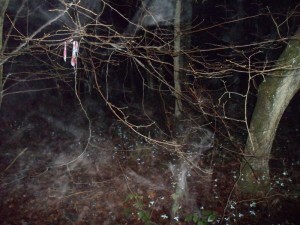 Various spirits joined us throughout the session, from a young female energy who was about 18 years old to a young boy called Tommy who was about 8 years old plus two male energies one who was 23 years old and the other was much older at about 40 years old, this particular spirit I had met only a couple of weeks ago in this wood during a public event. 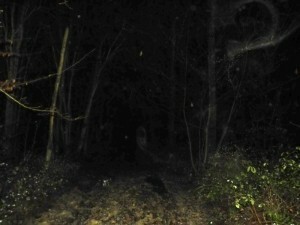 Throughout this whole session lots of odd and strange noises were heard within the woods including a few noises which sounded like footfalls and since most of this group were a little jumpy every time a noise was heard the group huddled closer together. On our way back to the meet point I held an EVP (Electronic Voice Phenomena a.k.a. ghost voice) experiment. The second group to the active pathway (which is what I call it) once again after handing out the electronic gadgets, spirit energies started to join us, this time the spirit energies were spirit who were going about their daily lives and were just passing us, one of which called Gordon stayed long enough for me to hold a séance. During the séance Gordon who was about 70 years old was able to move many of the guests arms, usually on command but he also managed to use our arms to stroke the faces of some of the group. Many guests felt a very hot or burning sensation in their hands throughout the séance. However Gordon seemed to be able to push people which ease, which is generally what happened to those who didn’t have their arms moved. After much swaying, rocking and pushing of people I ended the séance and moved onto another interesting area of the woods. This area we often hear sounds especially when using the spirit box (a device that scans the FM radio frequencies in reverse at 100ms). When asking for the spirit who was a school teacher roughly in her mid-40s to say any of the guests names we heard two faint or quiet names spoken on the box, both of these names were of those present but when asking for the spirit to repeat them, nothing was heard. Just as I was about to stop the spirit box we all heard what I can only describe as an odd tapping sound on the speaker, it sounded like someone physically tapping but what was strange is that one of our KII meters (EMF meters) also picked up on this tapping sound and the lights flashed on the KII meter in the same manner as the audible sounds. We can be sure this wasn’t a mobile phone because all the guests had turned their phones off before we started the evening. Not only that but if it were a mobile phone then we would have heard the normal search tones on the speaker on the spirit box. The noise we heard sounded nothing like a mobile phone, more like a real tapping sound on wooden furniture. At this point of the night I also held another EVP experiment. After re-grouping with everyone at our designated base point we decided to hold one large séance as the first group with me didn’t experience a séance as they were all too scared of the woods. We were joined by a male spirit in his mid-50s who had lots of energy and was able to push and pull people backwards with ease. He was also able to lift the arms of many guests and those who he couldn’t push he pulled them down towards the ground by their arms. Other guests had their faces and shoulders stroked by others in the group as the male energy moved around the circle making sure that he moved as many people as possible. At one point Harry had both his arms moved above his head which was strange because the event was for Harry. Many people then either side of Harry also had their arms moved upwards, whereas on my side of the circle we were being pulled downwards most of the time. This was an excellent night and one in which everyone eventually had some form of paranormal experience. Our Pluckley ghost hunts are very popular which is why this particular event was held on a Sunday, albeit a Bank Holiday weekend in the hope that it wouldn’t be busy either in Pluckley or the woods, however there were a large number of people in the car park when we arrived and were leaving after spending a couple of hours getting muddy walking around the woods. By the time we started they had all left the woods, but we could still hear them shouting in the car park. However as we walked deeper into the woods, thankfully we could hear less of their shouting and screaming. 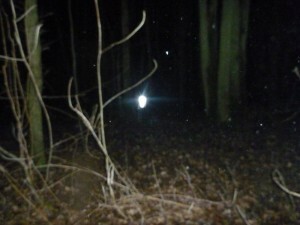 After stopping in the middle of the woods, which is where I normally start and after handing out some of our portable ghost hunting equipment the spirit energies started to make themselves known. Firstly by lighting up our KII (EMF) meters and then using the communication devices so that the guests could ask questions and get responses. Many people also took photos at this time and some of their photos contained some strange anomalies, namely mists. 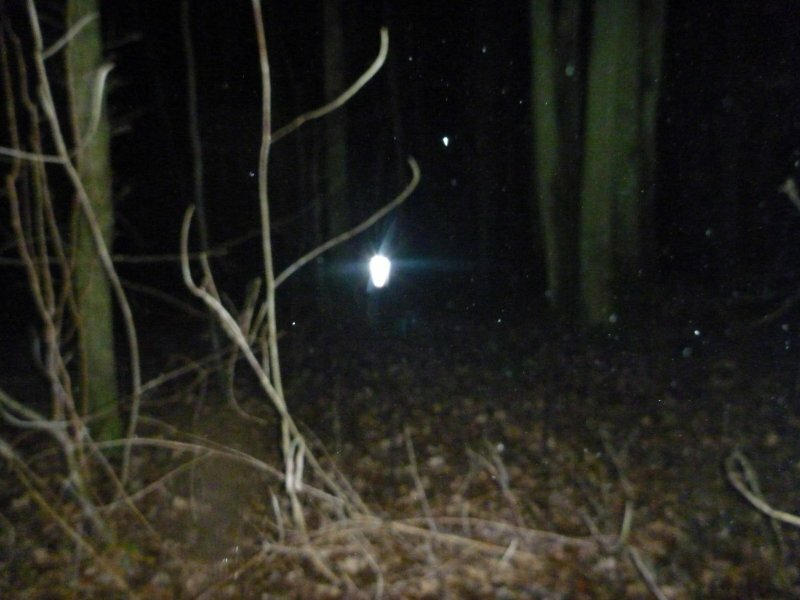 Light anomalies or orbs we ignore in the woods because it is probable that they are caused by an environmental issue; like pollen, moisture or insects. A male spirit called Thomas, aged 34 years old joined us briefly and some guests were able to use the electronic equipment to ask him questions. From here we moved onto another active spot, in fact it is the spot where I and previous guests have heard a strange female scream, which is probably how the woods got its name. At this location we were joined by a familiar male spirit to me, his name is Philip and he passed away in a motorcycle accident near to the woods in the 1960s. I asked Philip to move the arms of the guests when we were holding the séance, which he was able to do with ease. One of the guests was Spanish and did not understand any English, so it was quite a surprise to him when his hands started to move. Other guests including myself found this quite interesting because this particular person didn’t understand English then he could not have known what I was asking the spirit to do to him and others, which proved to the guests that it wasn’t mind over matter. Lots of guests also felt swaying motions and being pulled backwards into a sort of limbo position! Many guests were also touched (by the arms of other guests) on limbs that were recovering i.e. broken arms, shoulders, ribs etc. At the end of this séance session I held an EVP (Electronic Voice Phenomena a.k.a. ghost voice) experiment. From here we moved onto another active spot within the woods, the particular area is a much more spooky part of the woods, the trees have grown in an odd way, which many guests say they look spooky and that the trees seem to watch! Turning on my spirit box (a device that’s scans the FM radio frequencies in reverse at 100ms) and asking for the spirit present to say someone’s name it didn’t take long before we heard “Steve” plus some other names, although none of those were guests names. But we did hear the words “Go” and “Now”. With this the guests wanted to leave this particular part of the woods as that had spooked them out. Just as we were about to leave the area, two guests (a mother and her son) both heard a voice say “Jesus” however no-one else heard this, nor any noise that could be interpreted as a voice. This is something that happens frequently in this part of the woods, people have often heard voices or noises that no-one else hears. This was an enjoyable ghost hunt and one in which many guests had some form of paranormal activity that they couldn’t explain happen to them. This was the last of the early evening ghost hunts until much later in the year and also one of the occasions where some of the guests failed to notify us that they weren’t coming until moments before we were due to start. Those that did turn up were treated to an excellent ghost hunt with lots of physical paranormal experiences. The first session after handing out some of our usual ghost hunting equipment, lots of activity was detected on the KII (EMF) Meters and on our communication devices, where the guests were able to communicate with the spirit energy that was present. His name was David McGloughan (not sure of the spelling) although the spirit energy in question said “you can call me Dave”. He was 32 years old, quite tall at 5’11” and of a muscular build, wearing a cream granddad shirt and tan or light brown trousers and big heavy black boots. He had a round face, light brown hair and a stubble beard. I had intended to hold a séance here, but didn’t as we needed to move due to the coldness of the woods, so after we walked on and stopped at another crossroads. At this location there was another spirit energy; Tom aged in his mid-50s and about 5’6” in height, he was unshaven and had large sideburns that extended down to his chin. Guests were busy taking photographs as some of them had some very unusual mists or apparitions in them, it wasn’t a misty night, in fact there was no weather to speak of, it wasn’t cold either. After I set up the laser grid there was lots more communication via electronic equipment and KII activity, but nothing notable was seen in the grid. During this time there were some very unusual noises, which didn’t sound like the normal woodland creatures or the trees. This sounded more like purposeful tapping, more like a musical instrument and when I whistled out a distinct whistle back was heard, albeit a very faint one. At this moment we were interrupted by the sound of people who were shouting, mainly because they were lost and were trying to shout to the rest of their party whom they obviously got separated from. This went on for a while, which I found very amusing as I know where every path goes and we could clearly hear their anxiety. In reality they were only about 500 yards apart but on different parallel paths that don’t join up. After one of these groups decided to head back towards their car we were able to carry on. I held a séance where we originally came across the spirit energy Dave, Tom also followed us to this point. Everyone felt their presence as their arms we all moved on command and when I asked for the spirits to gently push people, they were happy to oblige. Many guests were also “wobbled” or swayed which the guests found slightly amusing. Tara (guest) had both her arms pulled backwards. All the guests were moved in some way and some of the movements were all what the guests asked for (in their heads). After the séance I turned on my spirit box (a device that scans at 100ms on the FM radio band in reverse). Some words were heard but they were very faint and not clearly audible. As we were leaving the woods we came across a group of people who were glad to see someone, however they were expecting their friends and not us and were disappointed when I told them where their friends were walking, because their friends were walking on a path that would eventually take them around the whole woods, which is a 5 mile walk. The day time before the event, there was some truly horrendous weather, with heavy rain throughout most of Kent so when heading off to Pluckley (in the rain) I wasn’t expecting it to stop. However once in the woods there was no rain, just a lot of mud, one of the worst I have experienced in Pluckley. It was also a very busy car park with swathes of people leaving or arriving all of them wearing all the wrong footwear for the conditions. As we headed into the woods to a particular area that I have found to be very active a group of teenagers were trying to follow us, however we were all dressed for the occasion they, were not and after they lost sight of us we could hear them trying to find their way out of the woods as several of them had fallen over into the mud. After 10 minutes we could no longer hear their voices. The first area, which is where I normally start, was as usual very active with high levels of KII EMF activity seen on our KII meters plus high levels on our communication devices. There was a female energy present who answered some of the guests questions and then abruptly left. I held a séance at this location and some arm movements were felt by the guests, some on command which progressed into pushing and pulling people backwards gently and then on to swaying and rocking people en mass left and right. One guest felt a touch from behind her whilst we were holding the séance which was unusual because we were all holding hands for the séance and there were no trees or plants anywhere near where we were standing. The spirit energy responsible for these movements is a spirit energy which I often see on this pathway, his name is Peter and he was a victim of a motorcycle crash in 1960s. There was also an older gent looking on, he was approximately in his 50s and spent most of the time laughing at what Peter had achieved. The second session further along the path I set up my laser grid mainly because there was a light fog hanging in the woods and this effect looks so much better with fog although no one saw anything unusual although at the same time I turned on the spirit box (a device that scan backwards through the FM radio stations at 100ms) and several words were heard although nothing definite in answer to our questions. Two guests however saw some very low level red lights in the near distance and whilst we could not rule out that this could have been other people we heard no footfalls or any other noise nor any torch lights. The third session I tried to hold another séance, there were a husband and wife spirit energies present, he was called Tommy (Tom) both aged in their late 30s or early 40s, he was a cow farmer and had rather large hands. The resulting séance there were some strange arm movements but unfortunately most of the movement was focussed at me, which was a shame as the rest of the guests would have liked to have felt these strange movements. All in all another enjoyable ghost hunt where many guests felt some unusual paranormal activity and saw some unusual light anomalies. No EVPs (ghost voice) experiments were undertaken due to the earlier rain which was still falling from the trees. We were a little worried that holding an event so late in December would be too cold for us and our guests to enjoy the ghost hunt. However the weather and temperature was actually quite pleasant considering the time of year, albeit rather wet and very muddy on the pathways. After making our way to my usual spot, which took longer than normal due to the vast amount of mud on the main pathway we gave every guest a piece of electronic equipment. Within a matter of minutes our KII meters (EMF meters) started to light up with detected spirit energies passing us and since every guest had either a communication device or a KII we could actually see the motion of the spirit energies as they walked past us. A male energy stopped and actually stuck around to talk to people and using the communication devices guests were able to ask him questions and get sensible responses. The male spirit energy however didn’t want to reveal his name to me, but he was approximately 45 years old and of a strong build. He also responded to questions but didn’t like us. He told us (via the communication devices) on more than one occasion to leave. During this period many guests heard some strange noises and saw odd lights, these were not noises that could be related to the woods as they didn’t sound like any animal I have heard before. The lights too were not in the sky, but much closer to the ground although they didn’t look like animal eyes as they were the wrong colour (white and blue lights). Many guests took photographs whilst we were using the electronic equipment and several guests photographed some strange mists and other anomalies on the pathway. From this point we moved further along the path and through yet more mud until we came to a crossroads. This crossroad in past investigations has been the spot of some excellent paranormal activity witnessed by the guests. Here we held a séance and a spirit energy called Jeffery joined us, he came from the direction that we had just walked. He was aged in his late 40s and from 1950s era and was a happy fellow who was able to move the arms of the guests and some guests were also treated to him pushing and pulling them backwards, nothing violent, but enough so that the guests knew that they were not responsible for losing their balance as it was controlled and on command. Some guests were also swayed from left to right as he passed them. After the séance we set up our laser grid and some guests saw shadows within the grid and further along the path, this is something which happens a lot on this particular stretch of path. The shadows look human shape, although they are never totally clear. We then turned on our SB7’s (Spirit boxes, which scan the FM radio stations at 100ms in reverse) and asked the spirit energies to say the name of a guest, or their own name. We repeatedly heard “Tom”, “Catherine” and “Tim” and considering we were using two boxes the names were not repeated at the same time but over the course of several sweeps alternatively. We also heard the name of some of the guests “Emma”, “Derek” and “Sharon”. It was however noticeable odd that the high KII activity that we had at the first location had not repeated itself at this location apart from some brief moments when those who were holding the KII meters walked away from the group. When they were 6’ or more away from the group the KII meters lit up much like the activity that we had at the first location. Whereas the communication devices didn’t make any difference as we had good communication throughout the whole ghost hunt. Once again a very enjoyable ghost hunt with varied and interesting paranormal activity witnessed by the guests. Carl Hutchinson (Paranormal Investigator) and myself we present from Ghost Hunt Events.